Microsoft added a feature to the Fall Creators Update of Windows 10 that restarts select applications that were open when the restart or shutdown command was activated. The feature lets users continue where they stopped on the next start of the operating system. Firefox reopens automatically on Windows 10 by default similarly to how Microsoft Edge or Google Chrome get opened automatically by default if the programs were not closed by the user before running the commands. If Firefox is configured to load the last session, that session will get loaded so that it is possible to continue exactly where you stopped the last time. Windows 10 users and administrators can block all programs from restarting on Windows 10 start or prevent specific applications from being reopened provided that these applications support it. Mozilla implemented a preference in the Firefox browser that gives users of the web browser control over the behavior. The default behavior of Firefox on Windows 10 -- Fall Creators Update or newer -- is to get reopened automatically if the shutdown or restart command was activated on the Windows 10 device and Firefox was not closed prior to that. It is naturally also possible to shut down the Firefox browser and other applications before you select the shutdown or restart option as this would prevent them from being reopened on start. Mozilla added a preference to Firefox to block automatic restarts of the browser on start of the Windows 10 operating system. Load about:config?filter=toolkit.winRegisterApplicationRestart in the browser's address bar. Double-click on the preference toolkit.winRegisterApplicationRestart to toggle its value. A value of True means that Firefox will be reopened automatically, a value of False that it won't be restarted automatically on start of the Windows 10 operating system. You can undo the change at any time by repeating the steps outlined above. Just make sure that you set the preference to True or False depending on your requirements. I turned off the feature on Windows 10 PCs that I use. While it is useful at times as it does away with the requirement to start programs like Firefox manually to start using them on start of the operating system, it sometimes led to situations where programs would open that I had no intentions of using during a particular session. While it is certainly possible to close these programs before shutting down Windows 10 to avoid this, it might not be clear at that time whether you'd require a program on the next start or not. Now You: do you find the automatic restart feature useful? 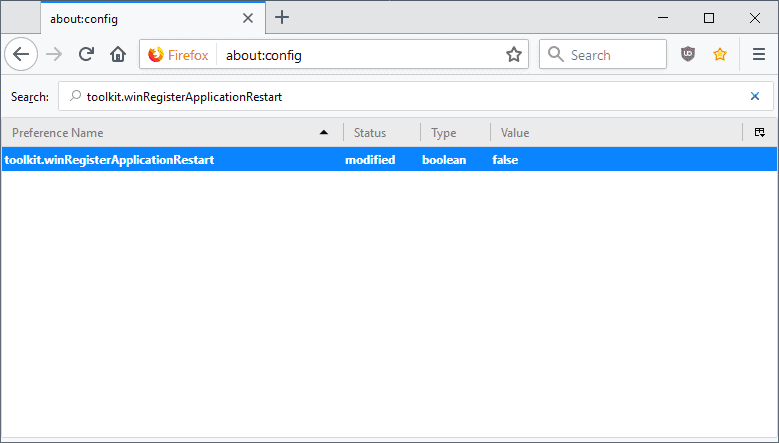 Find out how to configure the Firefox web browser so that it does not open automatically when you boot the Windows 10 operating system. No, I find it the exact opposite of that. It’s incredibly annoying and without value at all to me. @John – It’s an incredibly annoying “feature”, or at least – it would be if it has happening to me. Thankfully, my Win 10 is 1607, so I don’t get this. If I did get it, and could not turn it off (which I gather is the case), then it would super-annoy the hell out of me.